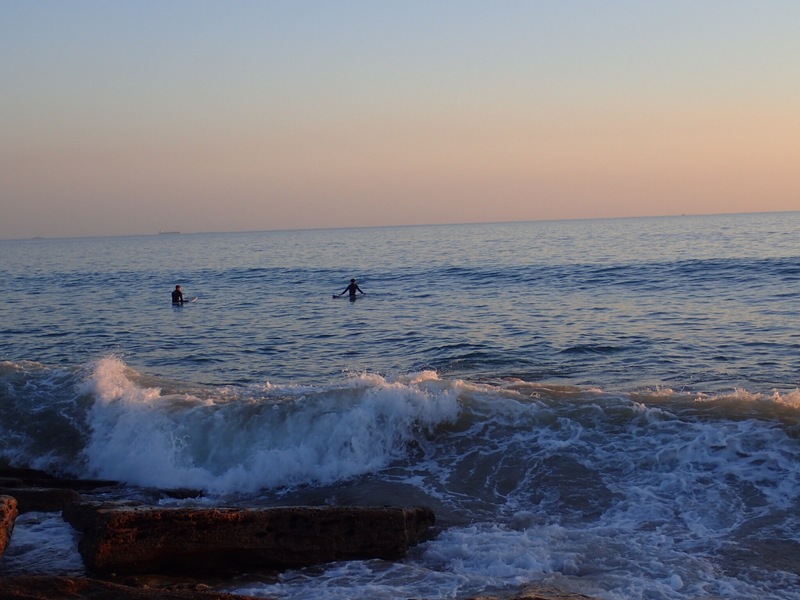 I am perched cross legged on the warm, faded wooden slats, my back resting against a thick cushion the color of sunset, my skin gulping the bright Moroccan sun that directly smiles upon the rooftop terrace of The Surf Hostel in Taghazout. A cup of fresh mango juice is nestled to my right, a bottle of water resting against my foot. It’s a Friday; a holy day in Morocco. A day filled with a resonation of long calls-to-prayer, the soft Arabic oozing from speakers surrounding the city featuring tones of passion and commitment. Couscous is steaming everywhere around the small surf town, steaming in great heaps in preparation for the day. The crashing of the noon waves against the sparkling shores adds rhythm to the tones, the gentle wind that carries my hair from my face adds to the beat. My hair is rather crusty from the salt water and I’ve been wearing the same shirt for a while now; we’ve all got this nice resounding cough and the past three nights have essentially been spent in a hostel-wide salty snuggle around a not-quite-loud-enough laptop for movie nights due to massive amounts of body-wracking fatigue. Also I’m pretty sure that I used my shampoo to wash my clothes today, but in accordance with the theme of most of my hygiene, I’m not entirely decided. I absolutely couldn’t dream of a better place to spend these past 5 days. It’s been capital to set up camp for “so long” after being squashed in a van for rides of 10+ hours the entire four days prior to us landing in Taghazout. 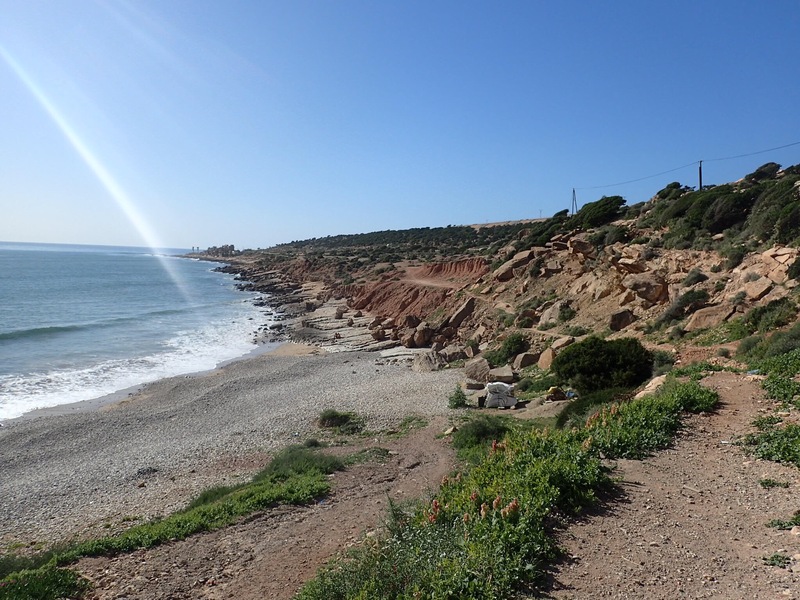 From the moment we set foot in Agadir, the last stop before reaching Taghazout, the scene was different. So much less intrusive than Marrakech, one could walk around the small rather Western-dominated surf town of Taghazout without the continual grapple for business, picking one’s way alongside droopy friendly dogs slobbering through power naps in the sun and little kittens with wide bright eyes chirping behind. After nestling in for some How I Met Your Mother, Katie and I popped back down to Panorama Beach with our absolutely capital buddies Sarah and Ryan to gaze at the fading sun setting against the frothy Atlantic, the bobbing surfers braving the point sillouhetted against the pink illumination. 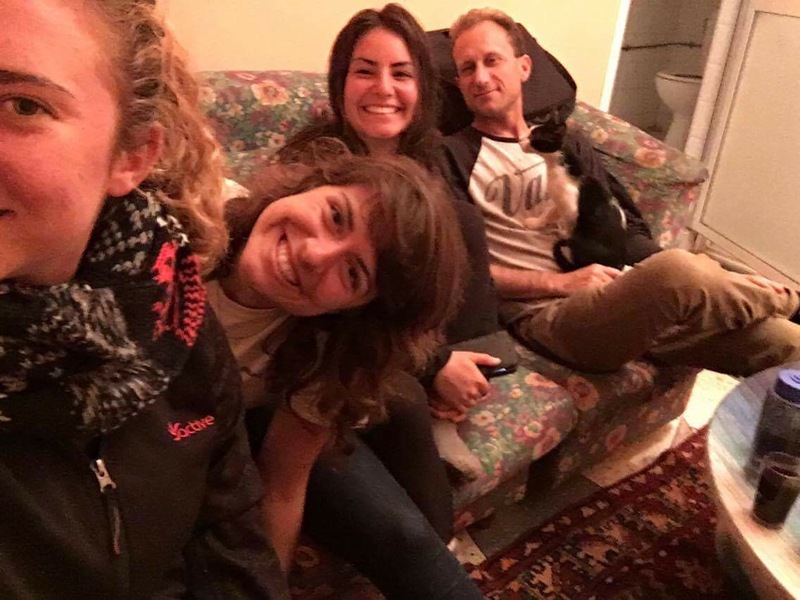 From there we moseyed to a little outdoor cafe, meeting up with our Frenchie hostel mate and two German travelers, chowing down into some veggie burgers, couscous and tajine. 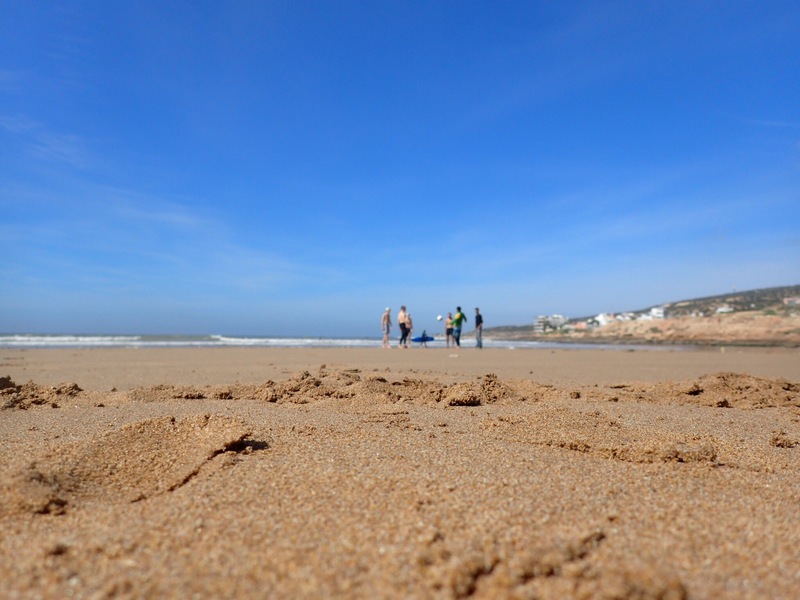 We dallied through topics of cruise ships and waves, German festivals and childhood television, life and love and strange-to-us Moroccan practices. And as we recline against the backs of the chairs, our bellies satisfied and the pleasing dusk wind massaging the face, a tiny little black and white kitten creeps up towards our table. She goes initially for Sarah, sensing her to be the most cat-loving of the group (of which of course she was not incorrect). 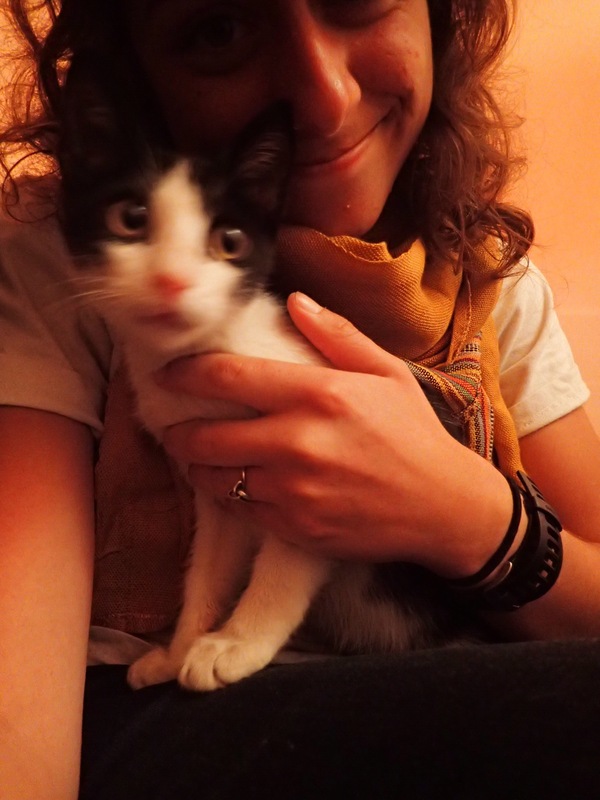 Sarah welcomes the little kitten heartily into her lap, and more symbolically into her heart, falling in love with the tiny head and the bright, open eyes. 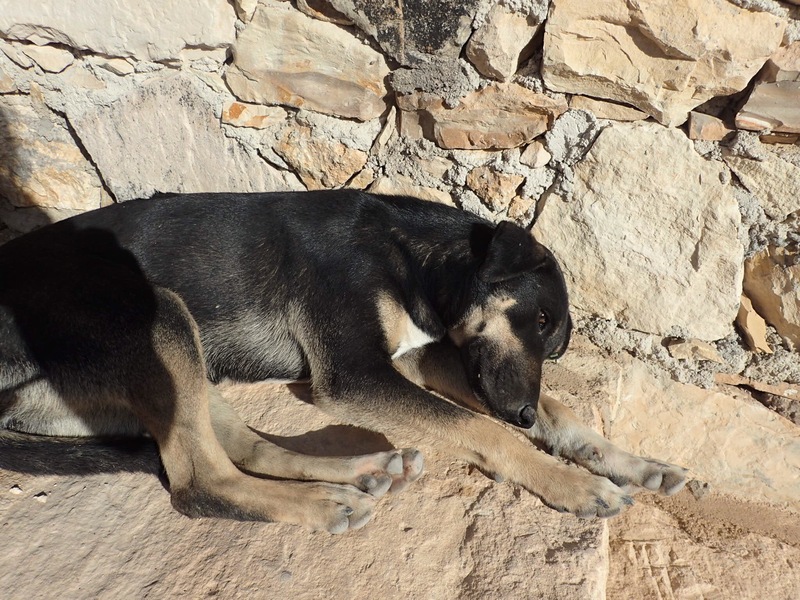 We scoot her scraps of Ryan’s fish tajine, sneaking it into her paws before the jolly owner could stop us, subconsciously teaching our newfound little pal how alright it is to hop up on tables and beg from tourists which I’m sure was appreciated. Ryan recognized the little chick as the culprit who sneaked onto his chest during a rooftop nap at the hostel, nuzzling her way onto his face and promptly sneezing loudly into it. This was confirmed by the amount of times she sneezed on each of us respectively around the table. We finish our after-dinner mint tea, pay for the delicious meal and meander back to the hostel. Atchoo follows close, darting alongside us, stopping only to peck at a few scraps. She jaunts merrily into the hostel with us, and none of us think twice about it; at this point in time, there were two dogs, a more-often-than-not stoned rabbit rescued from the meat markets by some Aussies, and a tortoise found at Anchor’s Point aptly named Tajine that had found a home in The Surf Hostel; Atchoo would be a welcomed edition. 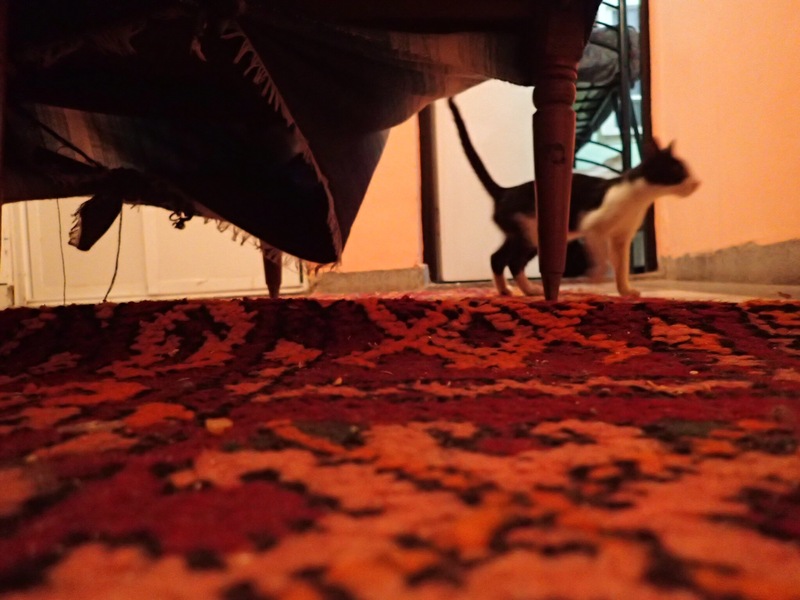 In this situation, she was the real master puppeteer; we bent to her will, following her as she surveyed the many floors of the hostel, peeking into the board room and her attempts to sabotage the kitchen. She didnt get along so well with Roxy, the sweetheart of a blubbering white lab, but Atchoo was clever enough to know how to place herself. She snuggled in with the group of us as we cuddled on the couch and watched some surfing videos, enraptured by the glow of the laptop screen. Honestly, I’m not entirely sure what came about with Atchoo. She ran off sometime during the videos, perhaps to find a quite nesting place in the hostel or return to her meanderings and manipulations on the streets. Now that she knows how effective her charm is, there’s no telling what will ensue. 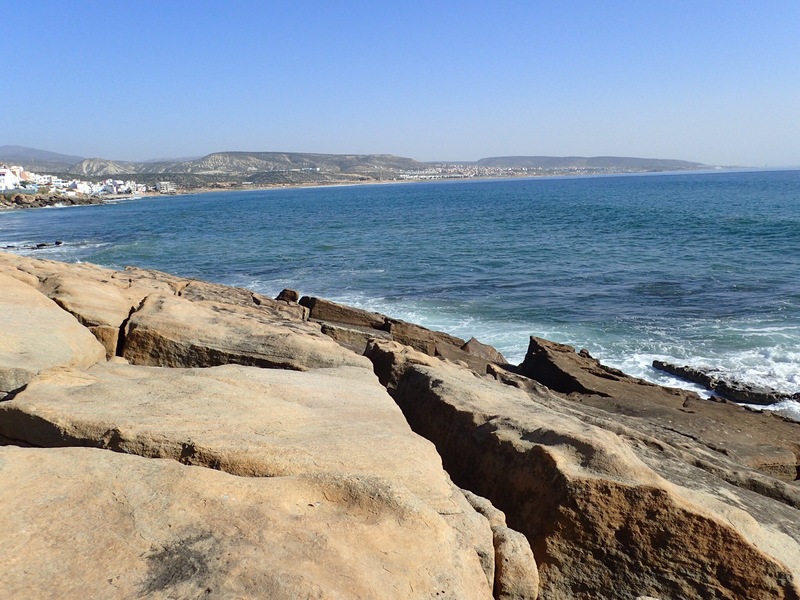 Taghazout, you were a grand oasis in a crowded, over-tourist-populated stretch of country. Thank you for your gentle waves, for your loving inhabitants, for your magical peace. You gave us serenity and sun and friendship; what an excellent choice of a stop.